With the weather being great again, I ventured back out on Sunday to do some more solar work. The hi-res main disk shot represents a six panel mosaic using my 2.5x Televue Barlow. If you look at the 270deg mark on the eastern limb, you will see the prominence group that I did the 2 hr time-lapse animation of. 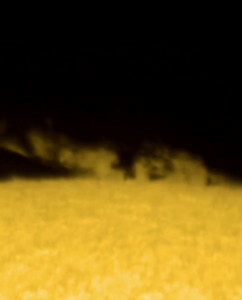 Considering the dynamic nature of the suns surface, some very interesting detail can be seen. You may also notice some slight gradient variations, where I struggled to combine each panel. I'll try to do better next time. 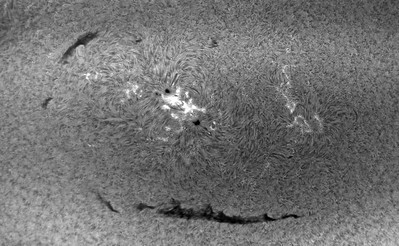 The second shot is of the active sunspot region AR2585 using my 2.5x Barlow. Equipment used was a Lunt LS100THa double stacked on an Atlas EQ-G mount. 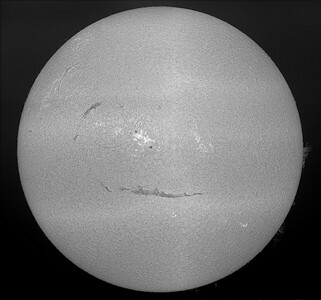 Guiding was accomplished using a Hinode Solar Guider. Capturing camera was a ZWO ASI174MM, using both a 2.5x and 5x TeleVue Barlow. All capturing was done with Firecapture. Post processing was down with Autostakkert II, Registax 6(wavlets) and Photoshop CS6. I decided not to add false color, to maximize contrast. With two nice days in a row, I couldn't resist going back out to observe my favorite celestial object. This represents my second attempt at trying to make a prominence animation. Still much to learn. This prom was on the western limb, and was the largest overall prom at the time. Used my Lunt LS100THa, in double stack mode, on top of my Orion EQ-G mount. Capture camera was a ZWO ASI174mm with a TeleVue 5x Barlow. Data collection was accomplished using Firecapture's time lapse mode. A total of the 113 x 5sec captures with a 1 minute delay between captures was used. Post processing was done with Autostakkert II and Photoshop CS6. What really made this all work was using a Hinode solar guider. This represents almost 2hrs of data, and at no time did I have to touch the mount to readjust the position.